My call to Christian ministry came when I was fifteen. I sensed that I was being ‘called’ to become a pastor. That I’ve maintained that sense of call for forty-five years is for me a testament to the working of God’s Spirit. I have many influences that helped shape my faith. One of those early influences was Billy Graham. Rev. Graham died today at age ninety-nine. As a boy I remember watching Billy’s evangelistic ‘crusades’ on television. The messages were always straightforward: ‘God loves you and all you need do is confess your sin and accept Jesus as Lord and Savior and eternity with God is yours’. Billy would hold up his Bible and with the warm cadence of a preacher from North Carolina, he’d proclaim ‘the answer to every human longing is to be found in Scripture’. His sermon would always conclude with a choir singing ‘Just As I Am’ as people were invited to profess their faith. As a kid from stoic New England, I was moved by adults of all ages and races coming forward by the thousands, often with tears, to receive a prayer of forgiveness and acceptance. Many people were then connected with local faith communities within which to continue their life as disciples. It is estimated that this farmers son from North Carolina preached to 215 million people from more than 185 countries. Throughout it all, Billy maintained a spirit of humility and never succumbed to the scandal of the prosperity gospel with its opulent wealth, nor inappropriate conduct too often found with ego driven evangelists. It has been a long time since I was fifteen. 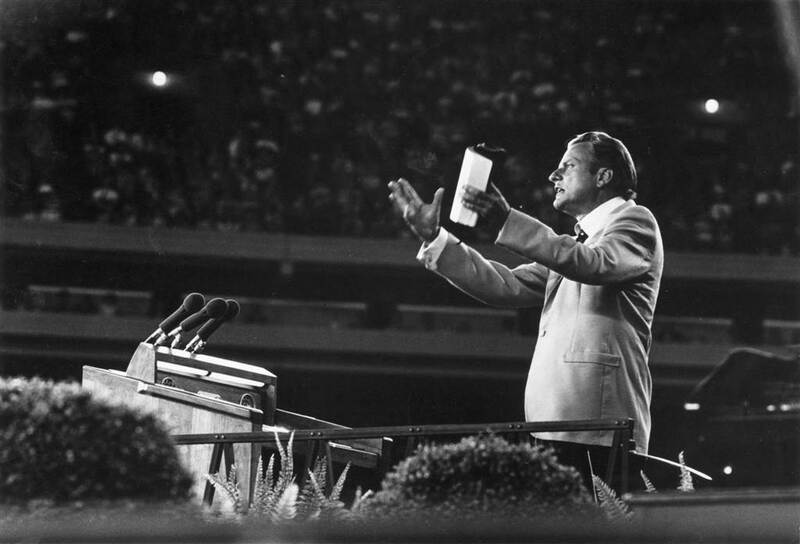 I remain grateful for the easy cadence of Billy Graham’s preaching, which helped awaken a ‘call to ministry’ within me. My own theology is broader than that of Rev. Graham and his primary emphasis on a personal faith commitment. With notable exceptions (refusing to preach to segregated audiences and speaking out against the proliferation of nuclear weapons) he avoided social issues. The impact of my own relationship with Christ, has brought me to picket lines for racial justice, against war, access to health care and for immigration reform. My partners on the line include Christians, Jews, Buddhists, Hindus, Muslims Unitarians and secular partners. The older I’ve become the more universal my faith is. I find beauty and truth in other faith traditions too. Yet, my personal relationship with Jesus remains primary to my call. I have Billy to thank. The essential message that he preached for so many years, remains central: “God loves you”. To this I say ‘Amen’. For the life of Billy Graham, we give thanks to the Lord. May his message of ‘love’ rooted in faith, continue to be spoken by many languages and by many faiths. P.S. My son Doug came forward to accept Christ at Billy Graham Crusade in Cleveland OH! Thanks for sharing your reflections Kent. Colin, good to hear from you. You were in good company at the Kingdome. And, Johnny and June, awesome.